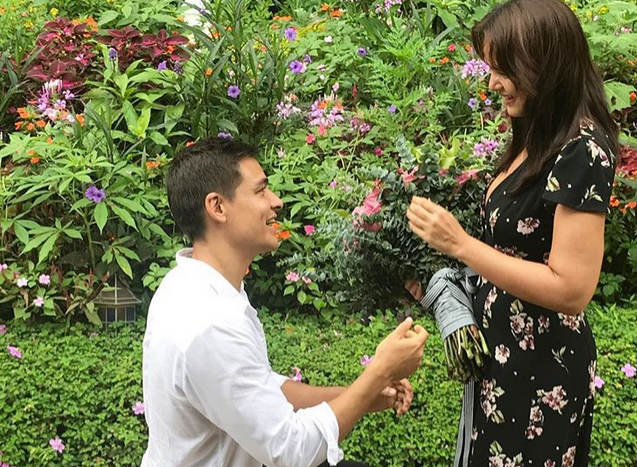 Actress Iza Calzado just got engaged to her long-time beau Ben Wintle! The couple's friends made the announcement on their respective instagram accounts. Fashion designer Rajo Laurel posted a photo showing Ben going down on bended knee to ask for Iza's hand in marriage. IZA SAID YES! Congratulations to my friends @missizacalzado & @benmwintle on their engagement! What a blessing to witness this special moment in your lives. ❤️❤️❤️ So happy for you both! Karylle, on the other hand, shared a video clip taken during the proposal along with her congratulatory message and a short story about the couple. "I first met @benmwintle and his payong in almon marina...then we watched the #blackeyedpeas later that night. Eventually, we became partners in his @bookyapp, traveled to KL, LA, shared stories about..., I've watched him as a pole on the dance floor and i watched him gently stay at iza's side during the bad times. I made sure to get Tito Lito's approval which of course Ben Tumbling got at the hospital. Si @missizacalzado, you know how much we love each other naman na. Love u both and congratulations." she wrote.